On February 24-25, the Dallas Convention Center hosted the largest all star cheerleading competition of the year, with 23,655 athletes representing 1320 teams from 39 states and 9 countries coming to compete at NCA All Star Nationals. Not only was this year’s event the largest competition of the season, it was also the largest NCA All Star Nationals event in history! Our staff spent the weekend in the convention center’s arena, watching 142 Worlds teams compete for the coveted NCA National Champion jackets, megaphone trophies, and one of 9 paid and 18 at-large Worlds bids. 2018 marked the first year for the X-Small and X-Small Coed Worlds divisions, which are already exploding with talent! 11 teams took the stage in XS5, where Cheer Express Miss Silver was the team to beat, after finishing first at Cheersport Nationals the weekend prior. Central Jersey All Stars Bombshells, who medaled at Worlds in SS5 in 2017, put up a good fight that landed them in first place after the first day of competition. However, some issues for Bombshells on day 2 combined with Miss Silver executing a flawless day 2 performance, led Miss Silver to take the lead and win the division by 0.6 points, with Green Bay Elite Lime finishing in third. Miss Silver now has their eyes on the UCA International All Star Championship this weekend, where they have a chance to win Varsity’s Triple Crown if they are able to win that competition as well! In X-Small Coed 5, SCV X5 took home jackets, after jumping from fourth place to first on day 2. In the Small Senior 5 division, Cheer Extreme SSX was able to end Woodlands Elite Generals’ 5-year winning streak after Generals were unable to fully recover from a rough day 1 performance. The win also marked Cheer Extreme’s first-ever NCA win in a senior all-girl division. Having won both Cheersport and NCA, SSX will also be in contention for the Varsity Triple Crown if they are able to win UCA this upcoming weekend. NCA All Star Nationals’ largest division, Small Senior Coed 5, had 23 teams facing off against each other this year. Last year’s champions, Twist & Shout Diamonds, were able to successfully defend their title against their toughest competitors, including Brandon Senior Black, who won the division in 2013, 2015, and 2016 and are the reigning World Champions. In what many are calling an underdog story, Florida Top Dog Rain was able to break into the top three in the division, beating out big names like Brandon All Stars and the California All Stars. This division is looking like it could be anyone’s game at Worlds, with less than 1 point separating first place and fifth place here at NCA. In Medium Senior 5, the reigning World Champion East Celebrity Elite Bombshells were able to secure their first NCA win, beating out 14 other teams including outscoring the second place FAME Super Seniors by more than a point. In the Medium Senior Coed 5 division, Spirit of Texas Royalty took home jackets for the first time since 2014. In the most-watched division at NCA, Large Senior 5, all the heavy-hitters came to play and put on one heck of a show for the crowd. Finals was a hit-fest, with Cheer Athletics Panthers, Cheer Extreme Senior Elite, and Maryland Twisters F5 all hitting zero-deduction routines on day 2. In the end, Cheer Athletics Panthers were able to finish in first with a 99.13, earning them not only first in their division, but the title of NCA Grand Champions. This was Panthers’ first NCA win since their three-year winning streak from 2013-2015. 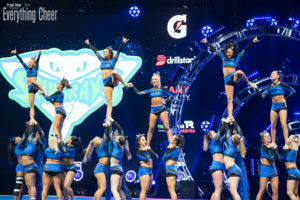 Cheer Athletics had an equally successful weekend in the Large Senior Coed 5 division, where the Cheetahs placed first ahead of Top Gun Large Coed by almost a full point. In the International Open division, fan favorite Cheer Sport Sharks Great Whites once again took home jackets, having won the division in 2017 and 2015. Another team that was able to successfully defend their NCA title were the Cheer Athletics Wildcats in International Open Large Coed 5, who went back-to-back-to-back with their win! Check out Worlds bid winners and the top 10 results in Worlds divisions below, or click here for a full list of division results and scores.